The Shining is the film that regularly shows up on ‘Best Horror Films’ lists, and its images of axes in a door and geometric carpets have achieved cult status. It’s even spawned its own documentary (Room 237) exploring hidden meanings and conspiracy theories buried in Stanley Kubrik’s 1980 adaptation of the Stephen King novel. It’s another of those iconic films which ‘everybody’ has seen and which I felt I ought to address. I know from previous trial and error that Stephen King material is not something which I get on too well with, and so this is one of the main reasons why I have avoided The Shining. The other reason is Jack Nicholson. I accept that for many he is charismatic, menacing and a force to be reckoned with. However, in the few roles I have seen him in I find his on-screen persona to be over-the-top and he downright creeps me out. I would honestly cross the road to avoid him if he were walking towards me. I think it’s the eyebrows. They are the scariest eyebrows I’ve ever seen. Nicholson plays Jack Torrance, whose descent into madness (or is it?) we follow, along with some weird stuff from his young son, as the family is isolated in a hotel over the winter season. The hand-held camera following the family around the hotel corridors, often over their shoulders, brings a distinct feeling of unease to proceedings. The maze of corridors reflects the external, actual maze which comes into play at strategic points during the narrative, and also the maze of confusion which Jack exhibits as his mental state becomes more confused. On the other hand, the music feels unnecessarily manipulative. Perhaps that’s more of a reflection of the 40 year gap between the soundtrack being written and me hearing it. I can’t possibly comment on The Shining without mentioning Shelly Duvall. Her growing terror is palpable even as she is trying to keep her son safe. And yes, I read about how appallingly she was treated, and no, nobody should ever have to put up with that kind of abuse under any circumstances. But that should not detract from what she does here. Her performance is far and away the best. Once I’d got to the end of The Shining, I felt short-changed. On reflection I think there was just too much going on for any one thing to completely grab me. I would have been happy if even more were made of the underlying references to the land being stolen from Native Americans. I was intrigued to consider how much of a role the implication of child abuse might have had on events, but of course that goes unanswered. I’ve already said that I’m not on the Stephen King wavelength, and had I been, that probably would have helped my appreciation. If this film were all about the strange little boy and his ‘shine’, and the way that affects the people and places around him, that would have been one thing. Had it been a psychological thriller about an alcoholic author who can’t find the way to write any more, and the way that affects his mental state, then fine. But having the two things together kept pushing me from one to the other, so that I wasn’t invested in either story. Is it about the supernatural? A psychopath? An alcoholic breakdown? And so I got bored. Yes, bored. There’s only so much ‘man chasing scared woman with an axe’ that I can take, and I was just waiting for it to finish. 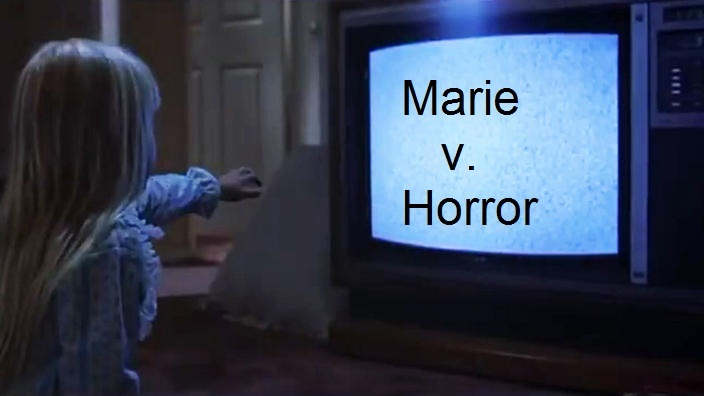 Of the three films I have seen so far for the ‘Marie vs Horror’ series, I can safely say that The Shining is the one that bored me the most. And I wasn’t expecting that!